HALLOWEEN may have just passed but for one Fishponds couple, every night is like October 31. For Kiri Green and Stewart Rowden are just batty about bats. The husband and wife duo travel all over the South West to rescue bats in need - babies, the sick and the injured. They have been spreading the word locally and have just given a talk at the Kingfisher Cafe as part of People's University of Fishponds series of events aimed at celebrating local people and their passions. Kiri and Stewart joined Avon Bat Group several years ago fuelled by their love of the nocturnal creatures and a desire to help conserve them. After going to a talk given by a trainee vet who was a bat carer and volunteering at a wildlife hospital for a while, they became bat carers themselves, running their own bat hospital. Each year they rescue and care for more than 100 bats, mostly during the summer months as bats hibernate during the winter. Both had experience of educating the public about wildlife and conservation through volunteering at Bristol Zoo and Avon Wildlife Trust, so it seemed a natural progression to start giving bat talks and running bat walks on behalf of Avon Bat Group. Bat walks are particularly popular - you get to watch bats flying and use a special bat detector to listen to the creatures' echolocation calls. The couple successfully applied for a special licence to bring along some of their bats to their talks. "This gives the public a brilliant chance to see what bats are really like up close, and see how amazing they are," said Stewart. All 18 species of bats in the UK eat insects, and most are about the size of your thumb. The biggest are only the size of you hand; a new-born baby Pipistrelle bat can fit on your thumbnail. Kiri said: "They are far more scared of us than we are of them - they think we want to eat them. And they need our help; their roosts and habitats need protection. As a mother bat only gives birth to one pup a year, and not every year, we need to help save as many as we can." For details of bat walks and talks coming up, keep an eye on the Avon Bat Group website - www.avonbatgroup.org.uk - and Facebook page. If you are involved with a school or group who would like to meet some bats, you can contact Kiri and Stewart via the website/Facebook page. Bat carers spend a lot of time and money on their work, so donations are always much appreciated. If you find a bat in need of help you can phone the Bat Conservation Trust on 0345 1300 228 - any bat not tucked away safely in its roost after dawn may need rescuing. 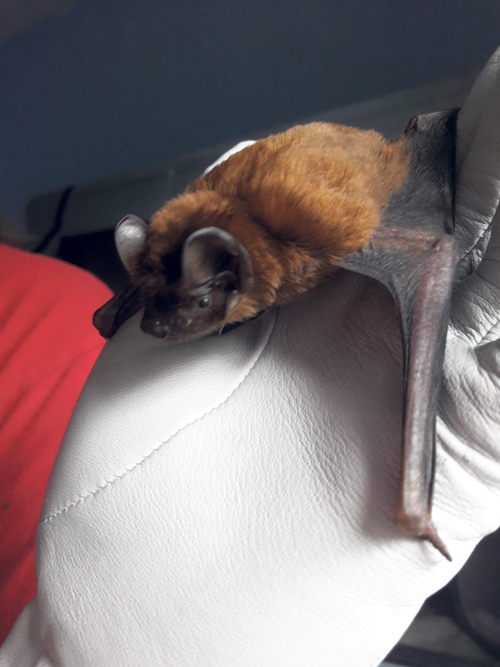 The Trust covers the whole UK and will put you in contact with your local bat carers, such as Kiri and Stewart.